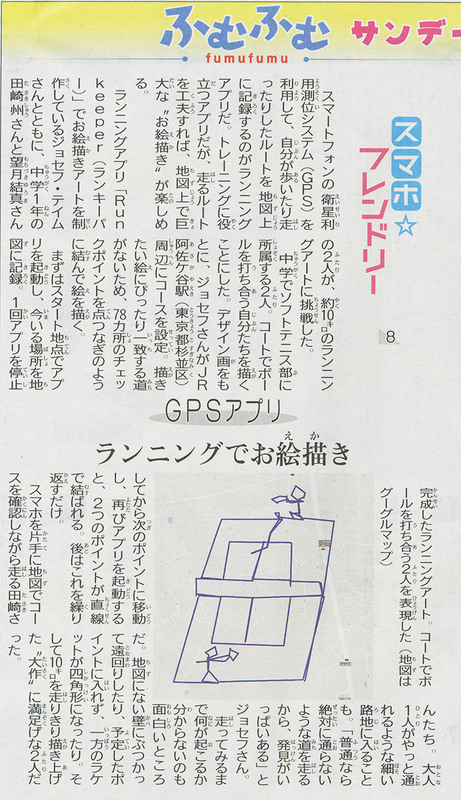 A couple of months back I was contacted by a writer at Kyodo News. She’d read about my running art project and thought it would be a good fit for a regular column that she writes, introducing interesting uses of smartphones for elementary and junior high school children. One Saturday afternoon I met up with high-school student Taro, his friend Yuji, and his father at Asagaya station. The picture that the boys wanted to trace was a little complex: both being keen soft tennis players, they’d decided to draw themselves in the middle of a match! What made this particular course tricky was the limited time and distance that we had to complete it in. We just had a few hours available, which limited the run to a maximum of about 10km. With a picture that contains relatively detailed sections (such as the two tennis players), you really need a large canvas to accurately plot the points that will make up the picture. 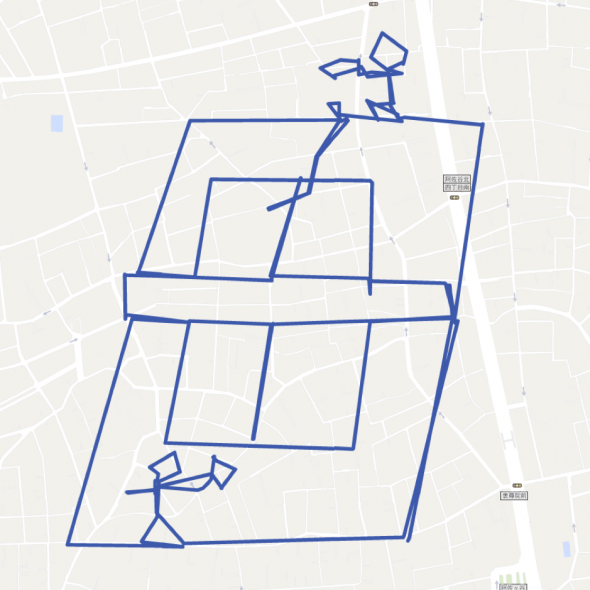 With this design, some of our points were only 10 or 20 meters apart – a real challenge considering the limited accuracy of smartphone GPS chips. To track the points we used Runkeeper; the boys picked up how to do it very quickly, and soon the picture was taking shape. 10km later it turned out great – especially the data from the wifi-only iPhone 5 that Taro was using. Ironically, the data from my iPhone 6+ which in addition to GPS and wifi had a cell network connection, was far less accurate. The course took us down some tiny alleyways, and at one point, into someone’s yard! When drawing the tennis racket at the top, we really needed to register a GPS point about 5 metres to the north of the road, but that was the other side of a padlocked gate. Fortunately, the owner just happened to be there, and what with me wearing my wind-powered LED hat he couldn’t help but notice us. I greeted him, and then explained what we were up to. “I don’t suppose it would be possible to just go over to where that bench is, at the back of your house” I asked. He smiled, and pleased to be able to assist us in our artistic mission, opened his gate and invited us in. At the end of the run we all admired our art work – not bad at all! My thanks to Kyodo News writer Asami Takada, and our runners Taro, Yuji and Yoshinori. 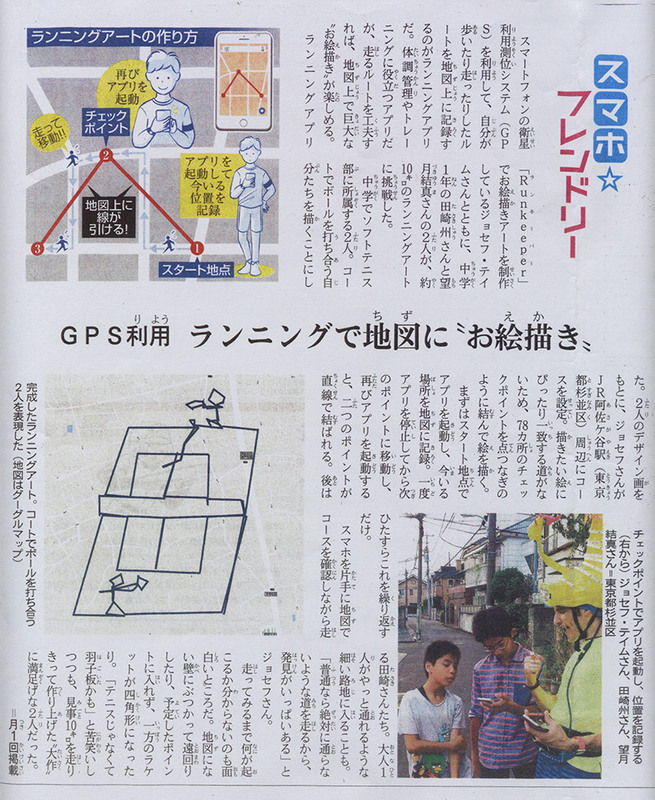 The article was published in a number of Kyodo print news publications.